First off, let me say that grandparents are amazing. They love you unconditionally and yet without enforcing any rules like a parent. Basically you can do no wrong and every choice you make is fabulous. I remember in Elementary School we had Grandparent’s Day and you could bring a grandparent to school with you. Why don’t schools do this anymore? So many grandparents play a pivotal role in their grandchild’s life; they should get more credit. Anyway, back to my point.. a grandparent that also gardens…? Perfection. My mom’s parents (they smile much more than this and like to wear L.L.Bean) live in Rehoboth and are old-time Swamp Yankees. If you don’t know what that term means please educate yourself on this website. I’m very proud of my Swamp Yankee heritage and love driving over and seeing my grandpa wearing his straw hat and bobbing around out back while my grandmother cooks up some local produce in their stark kitchen (or squirrel! that was an adventure!…a bit chewy). And you can’t get more local than your back yard. When I last went over there a little over a week ago my grandma Wini gave me a few pints of fresh picked blueberries from Dufont Farms. I used them for Sunday morning pancakes which were out of this world. Fresh blueberries sure are more sweet/tart than the little frozen kind. She also gave me some fresh green beans and a cucumber from my grandpa Jim’s garden. The beans were a great side with salmon but I’ve been holding onto the cucumber. I wanted to highlight the cucumber in some way rather than just chop it into a salad (or use it for a beauty mask). I don’t eat cucumber very often but it suddenly came to me what I LOVE that is cucumber – cucumber yogurt or tzatziki from Zaytoon’s. I’ve already learned how to make baba ghanouj because of them and decided to make cucumber yogurt. I found a recipe on allrecipes.com but it required me straining and draining the yogurt with cheesecloth. Um, hello? Yah right. Who has time for that? Who has cheesecloth? Upon a little more research I discovered that Greek Yogurt is basically plain yogurt that has been strained for you. Bingo. First peel your cucumber (I used my carrot peeler) and cut into thin-ish medallions. Then messily chop these again a few times and place in your food processor. Pulse close to smooth. Then add in a garlic clove (I used my garlic press first). Cut up a few mint leaves and add. Also add some parsley (a healthy pinch) and about 1 T of lemon juice (about half a lemon). Then a dash of salt and pepper. I’d be more specific but I don’t fully believe in being too precise when you cook. Pulse together. In a separate bowl spoon in about 2 spoonfuls of the yogurt. 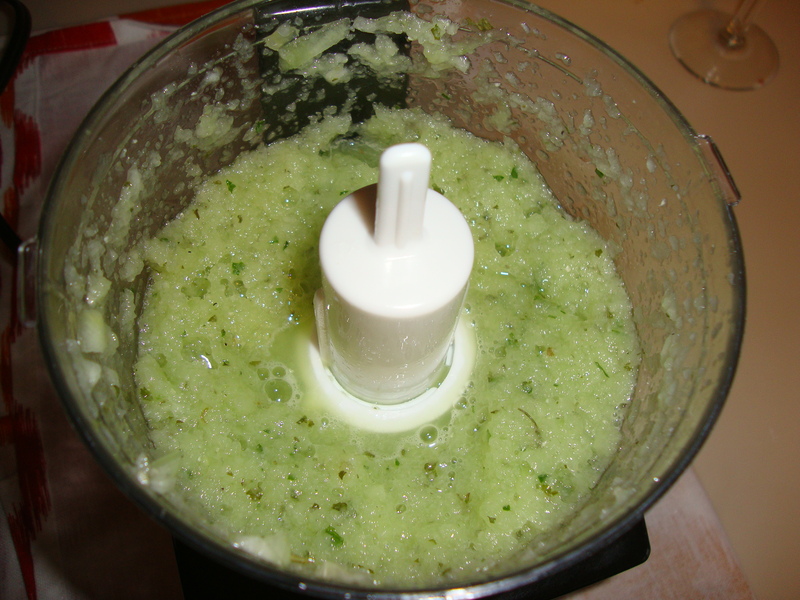 Take your mixture out of the food processor and blend together. I thought my cucumber “paste” looked a little wet so I drained it a bit first over the sink. Take a taste and sprinkle in anything else you think should be added. I put a tiny bit more lemon in mine and a tiny bit more salt and pepper. Eat with pita or use as a garnish on top of meat… perhaps lamb? P.S. 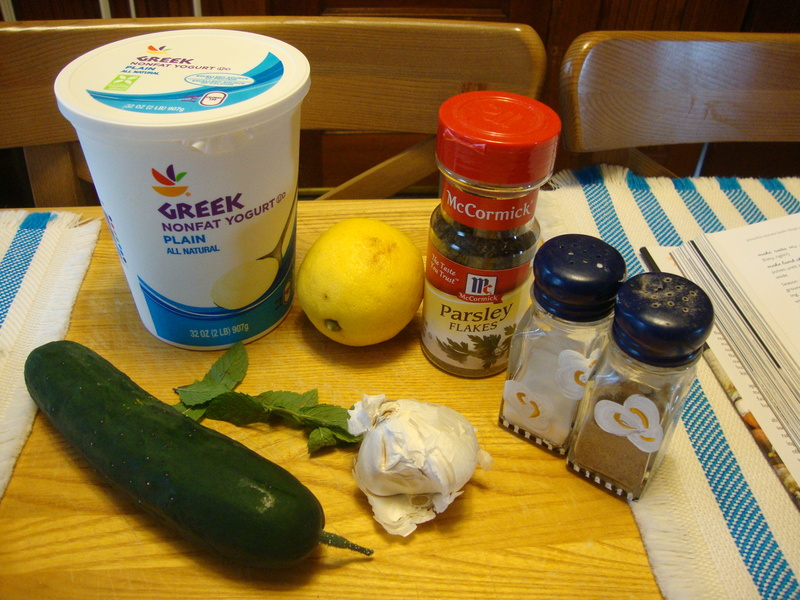 I have all this leftover plain greek yogurt… any ideas?